Android 9 introduces ITS-in-a-box revision 2, an automated test system for both wide field of view (WFoV) and regular field of view (RFoV) camera systems in the Camera Image Test Suite (ITS). Revision 1 was designed to test mobile device cameras with an FoV less than 90 degrees (RFoV). 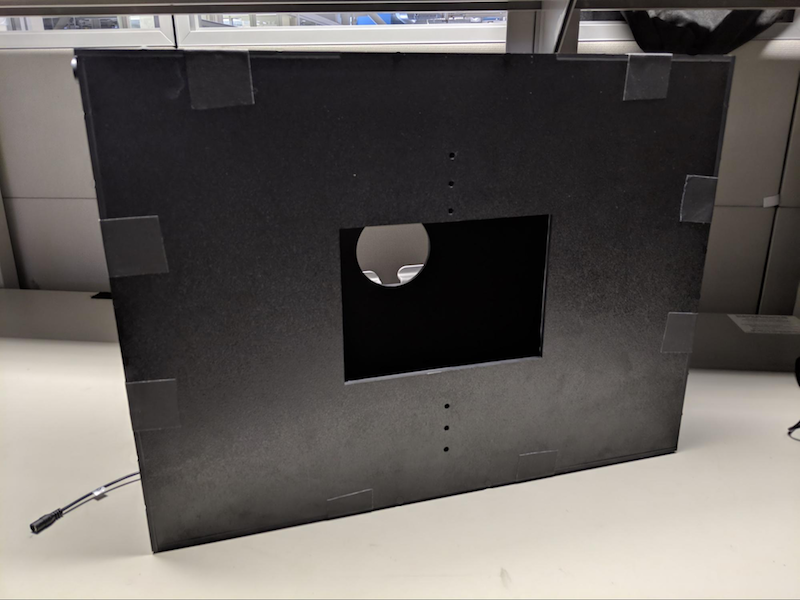 Revision 2 is designed to also test cameras that have an FoV greater 90 degrees (WFoV), enabling you to use one ITS-in-a-box system to test different cameras with varying FoVs. The ITS-in-a-box system consists of a plastic box laser cut from computer-aided design (CAD) drawings, an internal lighting system, a chart tablet, and a device under test (DUT). You can purchase an ITS-in-a-box or build your own. Note: For details on building ITS-in-a-box revision 1 (designed for RFoV cameras only), see ITS-in-a-Box Assembly. We recommend purchasing a WFoV ITS-in-a-box from one of the following qualified vendors. 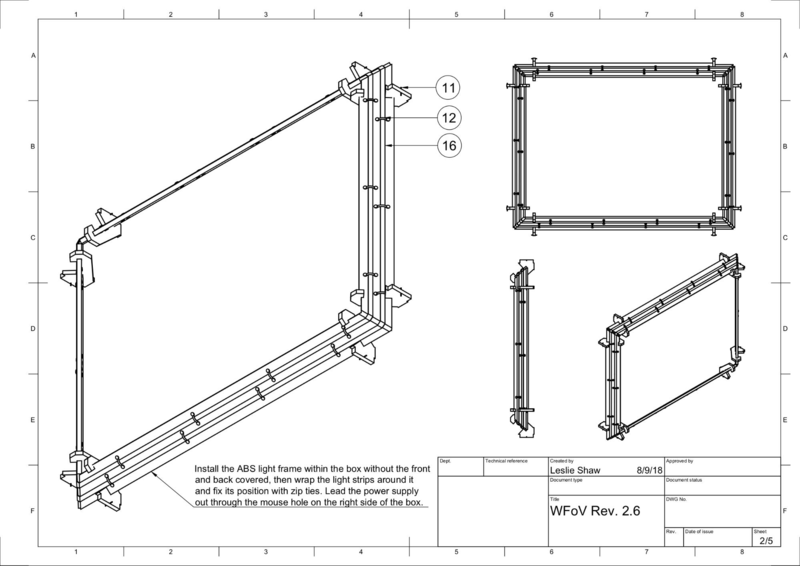 This section includes step-by-step instructions for assembling a WFoV ITS-in-a-box (revision 2) that can test cameras with a wide field of view (greater than 90 degrees). 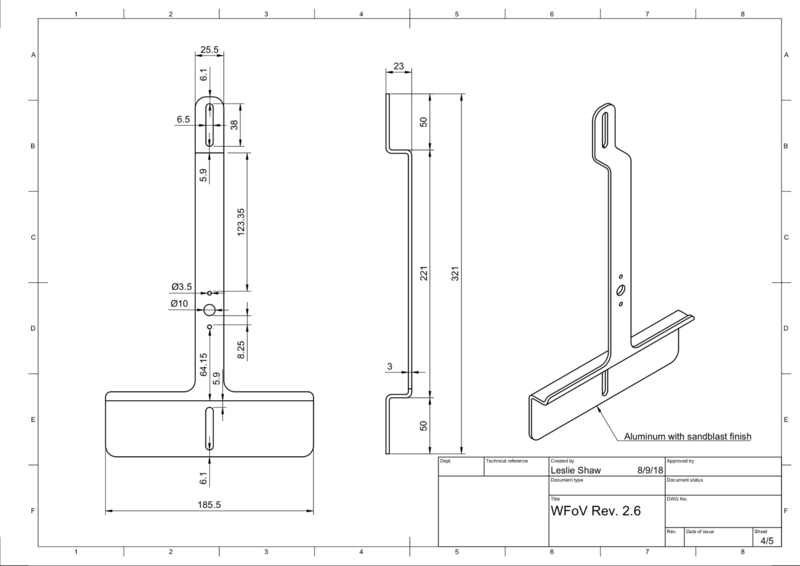 The WFoV ITS-in-a-box consists of a device under test (DUT), a chart tablet, an internal lighting system, and a plastic box that is laser cut from CAD drawings (shown in Figure 1). Note: For more information on past versions, see Revision history. Apply colored vinyl on the smooth side of the acrylonitrile butadiene styrene (ABS) and cut out the necessary openings as shown in Figure 1. Make sure to apply the white vinyl with the large rectangular opening on the tablet side and the black vinyl with the circular opening on the mobile device side of the box. For more information, see wikiHow. 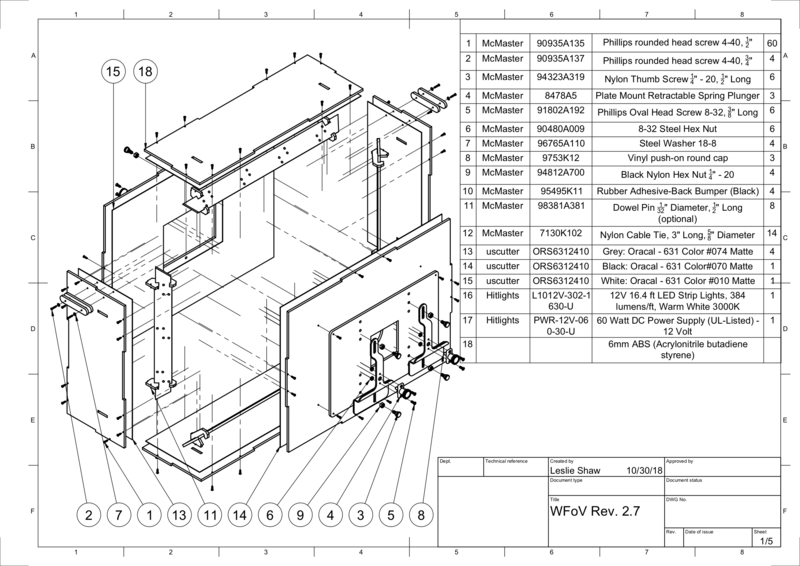 Review the mechanical drawing of the light frame structure. Gather the plastic light baffles, light mounts, LED light strip, and zip ties. Snap the plastic light baffles to the light mounts as shown in figure 5. This should be a tight fit. Snap the light mounts to the side panels as shown in figure 6. When complete, the light will shine towards the front corners of the box interior. Wrap the light strips around the baffles twice, use zip ties to tie down the strip, and snap the ends together. Figure 11. Zip ties showing on the side facing up. LED strips are on the other side. 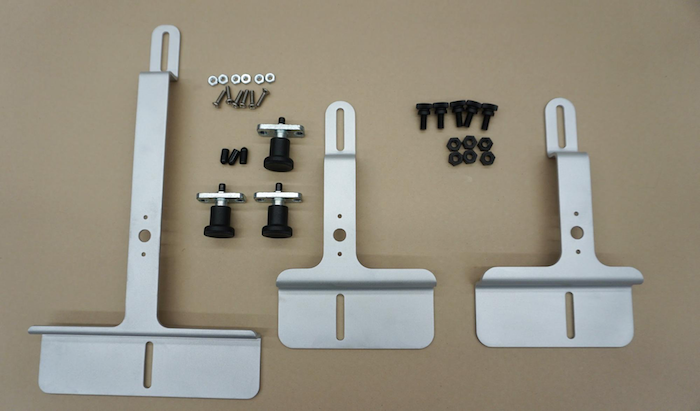 Review the mechanical drawing of the tablet mount. Gather the parts as shown in figure 13. Cut the push-on vinyl cap by ⅓ of its length and push it onto the end of the plunger. This ensures the plunger mechanism can be retracted and locked. Screw the plungers onto the mounts. Gather the front aperture plates and screw the smaller plate with the square on top of the larger plate as shown in figure 16. Tape the front and back panels to the rest of the box. Check that the power adapter is 12V, 5A. Anything below 12V will not work; anything below 5A may affect the brightness level of the lights. 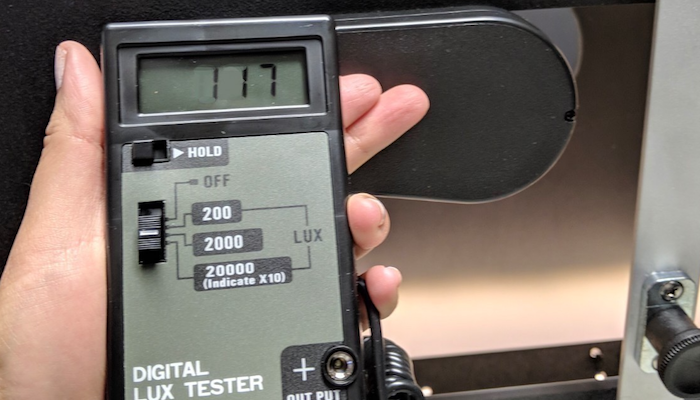 Using a digital lux tester, test the lux of the LED lights to make sure they are at the appropriate level. The YF-1065 by Contempo Views is used in this example. Place the light meter on the tablet side and turn it to 2000 lux to measure the light. The lux should be around 100 to 130. Anything significantly lower will be too dim for the tests and can lead to test failures. If the light is at the correct level, screw the front and back plates into place. If the light is not at the correct level, check the LED and power supply part number. Mount the phone mount on the aperture plate and the tablet mount on the opposite side with screws and nuts. The following describes the changes made to the WFoV ITS-in-a-box. Switched light in the BOM (#16) to UL listed LED tape for better manufacturing consistency. Switched power supply in the BOM (#17) to the same source as #16.